The FIBARO RGBW Controller gives you unlimited possibilities to design your lighting by using up to 4 colored LED strips per controller. Choose from millions of colors or have the colors reflect your mood or the weather. The FIBARO RGBW Controller is waiting for your ideas! 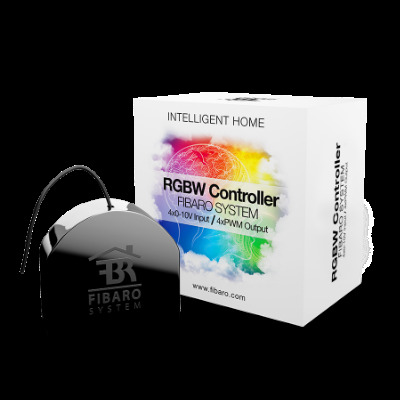 FIBARO RGBW Controller has support for up to 4 analogue inputs, supporting light sensors, wind sensors, pressure sensors and potentiometers operating within 0-10V. The FIBARO RGBW Controller is the worlds only wireless 4-channel dimmer for both 12V and 24V light sources. Take control of your light.